What can be a better way to look at the Renaissance than through the paradigm of a Tarot deck? Therefore I take the chance and introduce *my* Mantegna Tarot on the site - the engravings of the 16th century Cologne artist and printmaker Johann Ladenspelder (1512 - ca. 1580) which I have coloured to my own liking. The Mantegna Tarot was first created around 1480 in Italy, however the name 'Tarot of Mantegna' is misleading twice. First it is not a regular Tarot or Tarocchi deck, second there is considerable doubt that it was actually created by Andrea Mantegna. It is not known where and when exactly it was made. There are some hints that it might come from the Venice area, such as the use of the x in 'Doxe' and 'Artixan', and the title of a doge pretty much puts it in the area of either Venice or Genoa. Yet it was apparently widespread - wide enough for Durer to make a few engravings from it and of course wide enough for a Cologne engraver to copy it some 70 years after its birth. The deck sums up the world of the Renaissance, going from the lowest of man to the highest of the universal powers. It might have been used for educational purposes, for sophisticated entertainment, a cultivated game or all of that combined. The imagery was archaic and we will find a lot of the typical Tarot symbolism therein and perhaps get a better grasp of where the Tarot meanings have derived from - even when the purpose of this section is more to explore the times of the cards and not so much the deck itself. 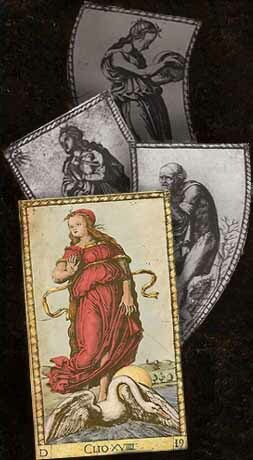 As of yet we know two versions of the Mantegna Tarot - the socalled E-Series and the socalled S-Series. This description comes from the letter at the bottom left corner of each card marking its section - so the 10 cards of the 'Conditions of Man' in the deck here on the site all have an 'E' - consequently it is the E-Series, the more beautifully crafted rendition.